The core of SikuliX is written in Java, which means you can use the SikuliX API as a standard JAVA library in your program. This applies to any Java aware scripting environment like Jython, JRuby, Scala, Groovy, Clojure and more, where you write your scripts in other IDE’s and run them using the respective runtime support directly. NOTE: When using the scripting support provided by the SikuliX IDE and when running Jython/JRuby scripts from command line using SikuliX, it is automatically taken care, that a basic path is setup, where SikuliX will look for image files, that are given only by their name (no path given). 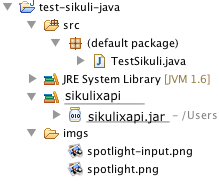 For information what you can do when using the Java API to have this convenience too, look here SIKULI_IMAGE_PATH. In most cases, you would need at least Screen and/or Region. Other candidates are Pattern, Match, Location, App and some more. More basic usage information is available here. Here is a hello world example on Mac. The program clicks on the spotlight icon on the screen, waits until spotlight’s input window appears, activates it by clicking and then writes “hello world” into the field and hits ENTER. It is planned, to publish sikulixapi.jar version 1.1.0+ on MavenCentral, so having a dependency in your project pom would be sufficient. Be aware, that some method signatures in the Java API differ from the scripting level. Javadoc of SikuliX (latest version). This is always fulfilled, if the running jar itself contains the images to be used. In other non-Maven project setups in NetBeans, Eclipse and other IDE’s this might look different. But what counts is the final position of the images folder in the resulting jar file relative to it’s root. 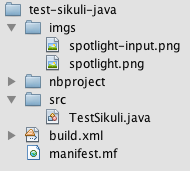 As a goody you might use the SikuliX IDE to manage your image folders inside your java projects. Just capture the images and save the “script” appropriately (e.g. as images.sikuli) in your project structure in a suitable place and add the path to your java program having the jar file on the class path at runtime. The ImageContainer class need not have any features, but must be valid (compileable).